Southwark is a London Borough which stretches from just west of Blackfriars Bridge to Dulwich in the south and Rotherhithe in the east which includes a sizeable chunk of the Thames Path and it is on this path that our points of interest are located. 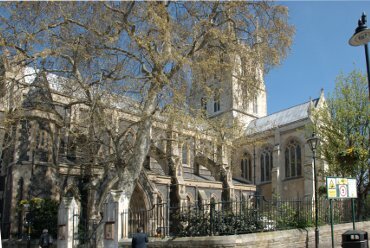 We start with one of the best known landmarks - Southwark Cathedral. The cathedral precincts are confined by the buildings which totally surround it making it difficult to get a photograph that does it justice. 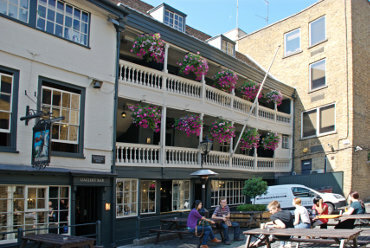 The George, inside its courtyard, is the only remaining original galleried coaching inn in London dating from the 1600s and is now owned by the National Trust. The entrance is in Borough High Street not far from London Bridge. There is another 'galleried pub' in St. Catherine's Dock near Tower Hill but that is a reconstruction and not a genuine original. Following the Thames Path eastward from Southwark Cathedral leads past Hay's Galleria; a wharf converted into a covered arcade housing shops and restaurants shown in the left half of the picture. The original wharf, Hay's Wharf, was built in the 1850s and took deliveries from ships from all over the world including the tea clippers from India and China. 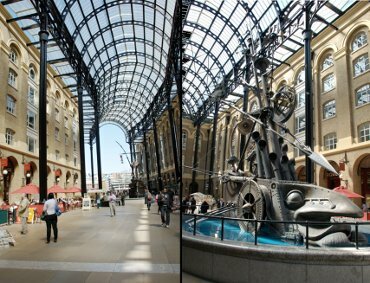 One particular item of interest is David Kemp's 60ft kinetic sculpture, The Navigators, with a combination of moving parts, water jets and fountains shown in the right half of the picture. 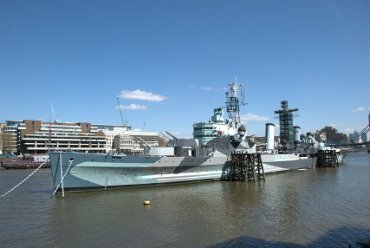 HMS Belfast is a warship which saw service in World War II and is now part of the Imperial War Museum. It was launched in 1938 and was commissioned into the Royal Navy on 5 August 1939. It is now open to the public every day. 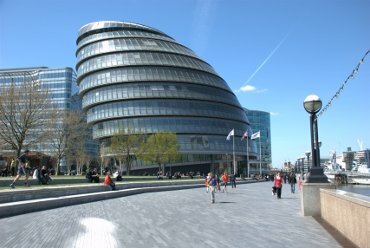 City Hall, not far from Tower Bridge, is home to the Mayor of London and the Greater London Authority. It has been described as a striking building and it certainly is that. It's unfortunate that someone leaned on it before the glue had properly set.